Ensure your building stands out from the rest with Archisign Architectural Signage. Quality architectural and directional signage is a fundamental element to your business, brand and how you communicate with your clients and customers. For over 30 years Archisigns have been serving industry leaders across all business sectors delivering high quality project specific and custom signage solutions. We have an in-house graphic design department and a large diverse manufacturing capability. We provide samples, design and manufacture “old fashioned” engraving as well as high tech state of the art applications using various materials, treatments and finishes. Our dedicated team can advise you on selecting the most attractive, durable, effective and functional material for your project, assist you in designing and creating a solution to your specifications and business environment. In addition to installation of all internal and external business signage. We have maintained longstanding relationships with a myriad of clients who own, manage or build multi story buildings, shopping centres and apartment buildings. At Archisign we remain committed to meeting the needs of a continuously evolving marketplace and clients with innovative sign solutions and unmatched dedication to service. Your letters are precision cut in Aluminum, Stainless Steel, Bronze, Brass, Copper, Steel or Acrylic. Formed Plastic Letters are also available in a wide variety of colour choices and type styles. We work close with our customers from the moment you approach us with architectural signage needs. Our signs are of superior quality and excellent appearance. Our custom signs are designed to meet the specific needs and tastes of our customers. Consultation, planning, fabrication, and installation are done along with designing and manufacturing. We can complete the entire work within your specified time period. We have an in-house facility well-equipped with state-of-the-art, computer driven sign making systems for all your exterior and interior architectural signage needs. Our highly skilled and experienced designers can work from your rough sketches and blueprints to make your sign project a successful one. We can create architectural signs in different styles, sizes, and shapes. We make use of different materials including photo polymer, acrylic, aluminium, and engraved brass for fabrication. Whether you want the signs to be kept indoors or outdoors, we can produce the most wanted architecture signs with attractive finishes and fine coatings. 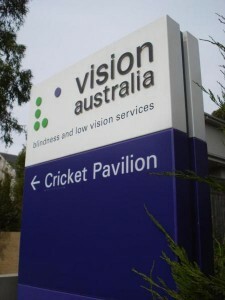 Architectural signage plays a very important part in a business and can often contribute to the success of the business. Challenge us with your needs for architectural signage. Call us today.